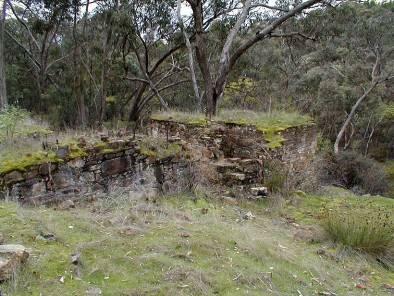 The Castlemaine Diggings National Heritage Park is situated in a distinctive cultural region known as central Victoria, in the centre of the Victorian Goldfields region, 123 km north of Melbourne and 38 km south of Bendigo. 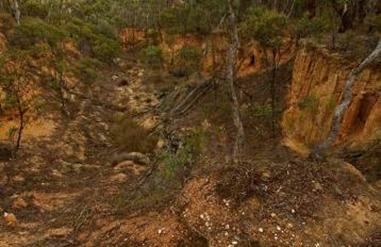 It extends 50 km from Castlemaine in the north towards Daylesford in the south, and is up to 10 km wide. The Park is managed by Parks Victoria. The Park is associated with the historic gold settlements of Castlemaine, Chewton, Fryerstown, Vaughan , Campbells Creek and Guildford . 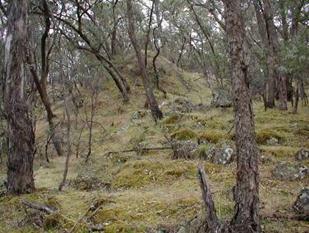 The bulk of the park is located in Mount Alexander Shire. It encompasses 7,440 ha and was proclaimed in 2002. 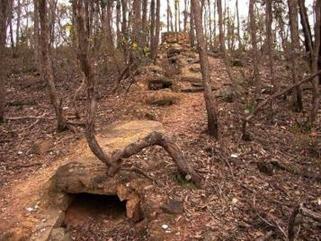 The Castlemaine Diggings National Heritage Park is an area of regenerating Box-Ironbark forest and is associated with the 1850s international gold rush known as Mount Alexander Rush. The Park contains the sources of the gold – sandstone outcrops, quartz reefs, and shallow alluvial (stream) deposits - that made it one of the world’s richest shallow goldfields. The goldfield produced over five million ounces of gold, most of it during the gold rush period, and from the first few metres of soil and rock. 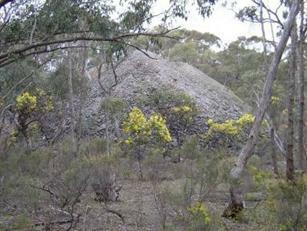 In 2005, the Park became the 6th place to be added to the Australian National Heritage List .…The Park is the most outstanding gold rush era site in Australia in terms of the diversity of types, integrity and time-depth of its collection of mining sites … Gold and the search for this precious metal, has played a major role in how our nation has developed. Its influence has left us with the enduring legacy of exploration, immigration, research, and industrial booms. 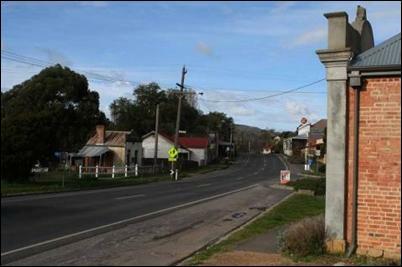 The two main settlements – Chewton and Castlemaine – were created by the Mount Alexander Rush and they adjoin the Castlemaine Diggings National Heritage Park. 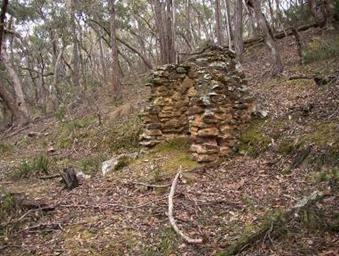 Chewton and Castlemaine are still linked a winding road that was established along Forest Creek in the first months of the Mount Alexander Gold Rush. 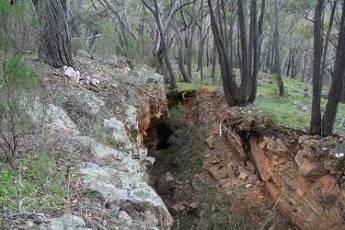 In its shape and its names, Chewton still wears the feel of a diggings settlement. Chewton’s streets are not shaped by pomp and bureaucracy, they wriggle and meander. You’ll find less squatters and gold officials honoured in the streets of Chewton - hardly any, in fact. Instead, some Chewton streets bear the names of the gold-bearing gullies and reefs that preceded them - you’ll find Adelaide and Eureka streets, Dinah and Manchester roads. Castlemaine became the centre of government administration when a large colonial government military camp was established in late 1851. The formal grid of the town was laid out by the government surveyor in 1852 with reserves for the government buildings, churches, botanic gardens and a market square that were constructed over the following decade. Castlemaine is a creative person's country town. Wherever you go in Castlemaine you can see it. Wherever you go, you can feel it. The Market Hall is the most striking building of the gold rush. Beautifully restored, it has the symmetry and symbolism of a Grecian temple and looks as if it was scooped up from the shores of the Aegean Sea . 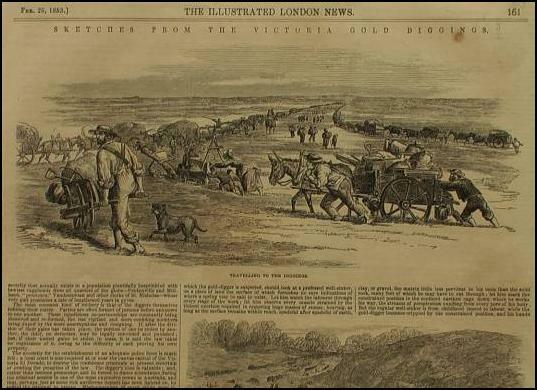 In 1851 in a tranquil wooded valley, in a far corner of the world, gold was found. 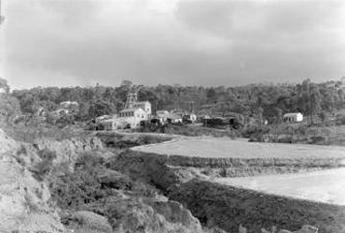 Within a year, tens of thousands of people flocked to the Mount Alexander area. They came from all the distance reaches of the earth to the ‘bank till free to all’: the richest shallow alluvial gold diggings the world would see. Australia would never be the same again. 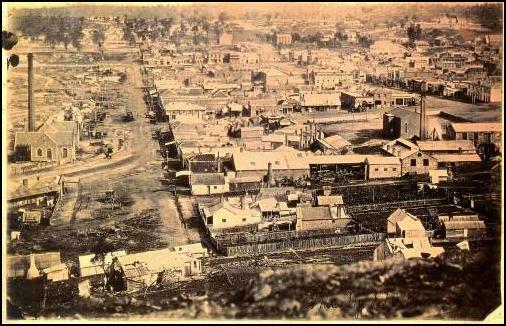 The name Mount Alexander in the early 1850s described all the gold-bearing country around present-day Castlemaine. The name was soon lost to all but the mountain itself as Castlemaine township became the centre of the goldfields. The historical data documents the immense scale of human occupation and activity … their efforts left a landscape that littered with depression and mounds. To some the diggings had the appearance of a graveyard¾It was a sight! Mounds of earth lying beside holes presented the dismal appearance of a graveyard, men washing dirt in tubs, carrying its colour on their skin, hair, hats, trousers and boots, miserable-looking low tents their places of refuge. Where water was to be seen it was puddle. The whole scene to a new chum was one of unspeakable squalor, surpassing all that his eye had seen or his fancy woven. 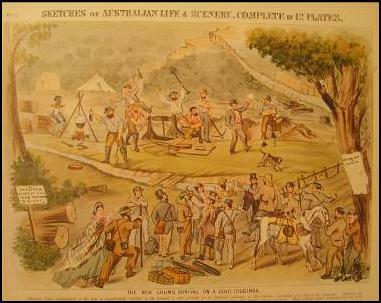 (James Robertson, in Records of Castlemaine Pioneers, p. 47, Forest Creek, late 1852). 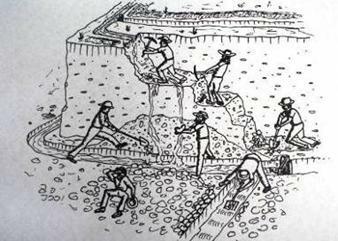 Each digger was allowed a claim of 8ft x 8ft (later increased to 12ft x 12ft) in which he could dig a shaft and pile excavated earth and rocks. Gold diggers supplemented the tin dish with a tub for soaking (or puddling) a load of washdirt. 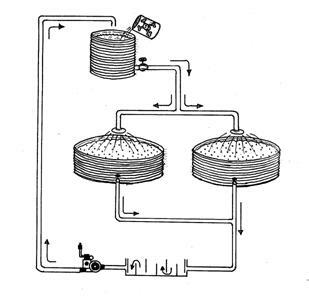 Tubs for puddling could be half a beer or brandy barrel, or a hollowed out log - put contents of four or five buckets of washdirt in tub (half beer barrel or brandy cask)—then fill it to brim and turn earth over and over with a spade - first lot of water, reduced to mud, is thrown away and replaced three or four times until only stones and gravel remain in bottom of tub—separate further with huge strainer or sieve—then empty fine residue into large tin dish, then wash at pool or creek. (Fauchery). Sluicing involved the use of running water to break down gold-bearing earth, and a sluice box was used to recover the gold. 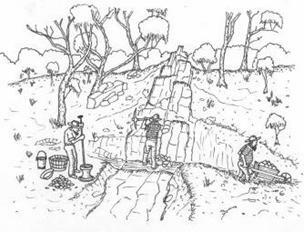 It involved washing alluvial material through a channel with riffles (a set of bars or slats) in its base for the capture of a heavy mineral released from its surrounding material. An adjunct to this form of sluicing was the construction by miners of diversions was to gain drain to gullies, creek or river beds, and to provide a water supply to their sluice. 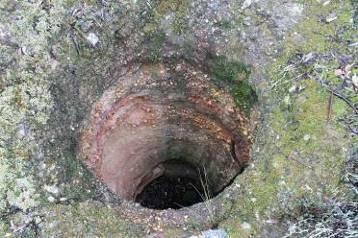 Often, diversions were made through channels dug alongside the gully, creek or river, and occasionally, where rivers ran in large loops around rocky spurs, tunnels and cuttings were used. Few historical accounts have been found dealing with diversions. 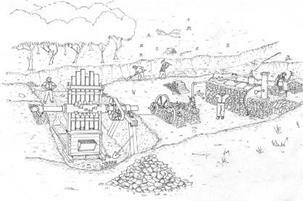 With all the easy ground taken up, latecomers to the rush commenced mining a new type of ore deposit, called cemented gravels. As a creek or river develops from a stream to maturity, the water cuts its way deeper through the earth’s sediments, leaving behind a ‘staircase’ of abandoned banks called high terraces. 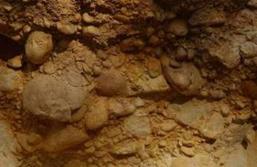 The constant cycle of erosion often leave the ancient gravels exposed as low hills alongside the major creeks. Gold diggers found the ancient deposits rich in gold but quite different to mine than the creek flats and gullies - it is dreadful work to sink in some of the hills, which can be effected only by gads and hammers, and the driving of three inches is generally a good day's work for a couple of good able miners; whereas they could easily sink six feet per diem in the gullies. [83: 8/3/1852: p.2]. 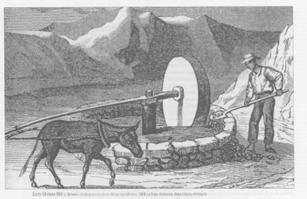 These horse-powered machines could process a couple of tons of earth and were introduced to enable the alluvial (or free gold) gold to be separated economically. 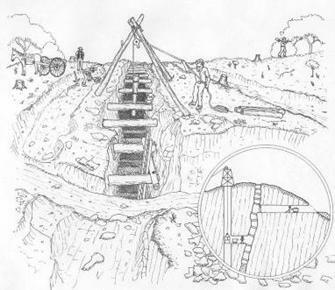 A puddling mill consisted of an annular timber-lined trough with centre bearing and a revolving horizontal timber pole with a trailing harrow like implement to break the clayey gravels into a slurry and drawn around by a horse following a circular path. Water was provided via a race and the slurry was taken of via a tail-race. A ground sluice is a constructed or excavated channel through which flows controlled amounts of water. The sluice included an inlet (head race); sections which contained timber sluice boxes for collecting the gold by means of various configurations of riffles and mats to trap the heavier particles while allowing the waste to continue through; and a main drain (or tail race) to dispose of large volumes of soil downstream. 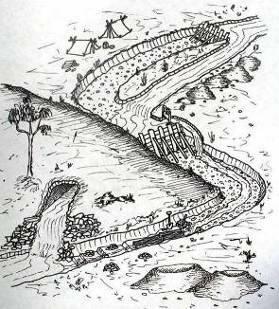 The water was delivered via a race to spurs above the selected mining areas and then directed downwards through the auriferous gravels, concentrating the gold (in the sluice boxes) and bearing off the lighter material down the tail race. Ground sluicing left behind high remnant faces and large pits with pebble heaps on bedrock through which run networks of channels connecting to the tail race. At first the miners open cut, working only the surface shows of quartz, but to work at any depth they had to sink shafts or drive tunnels. 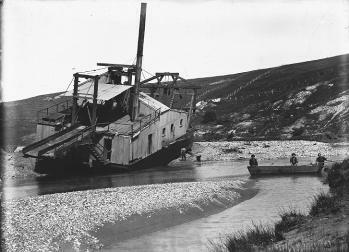 Most miners were able to profitably work their ground with hand or horse-powered machinery—haulage whims and whips—down to the water-level. Mining below the water level required steam-powered pumping and winding machinery, the cost of which usually led to the development of large company mining. 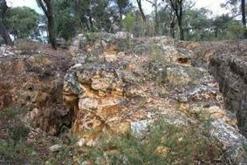 The evidence of past quartz reefing is probably the most extensive and best preserved of all mining types. 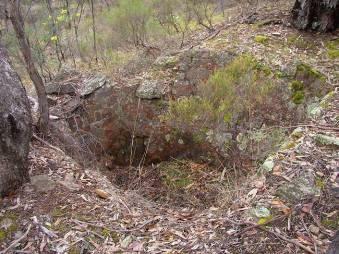 Relics survive from all mining periods and types of operations and include such things as surface workings, mullock heaps, shafts, poppet heads, whip and whim foundations, machinery foundations, and abandoned plant, buildings, tracks and tramways, water dams and slum ponds..
A necessary preliminary to early quartz crushing was the roasting of the rock in a kiln. Roasting ‘softened’ the quartz, making it brittle and easier to crush. 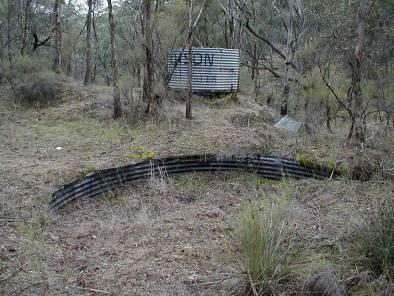 Quartz roasting kilns can be similar in shape and construction to lime kilns, but have been found in Victoria as free-standing masonry structures, and also excavated into bedrock on hill slopes. The roasting process leaves a characteristic reddish/brick coloured glaze on the interior of the kiln. The quartz had to crushed to a fine sand to extract the gold – methods ranged from the primitive hand dolly to large, highly capitalised, crushing and treatment plants. Early crushing mills (Berdan pans and Chilian mills) and stamping batteries were in some cases driven by horses initially; more commonly, though, steam-engines or waterwheels powered them. Batteries with revolving stampers were to become almost universally used in Victoria and continued to be so until the 1950s. The engines and other appliances were often housed in galvanised iron or timber-clad sheds. 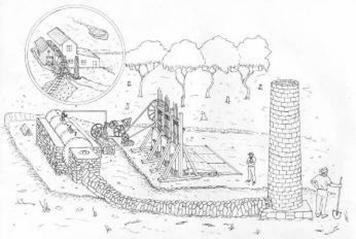 Blight and party, who have united with Stewart and Robbins, have their mill now in fine working order, and have been doing good execution of late. In the clearing away old stacks of quartz, the richest having been previously crushed, the yield has been from two to nine ounces to the ton. The yield of their famous rich stack, we never could get at, and our impression is, that it did not fulfill their expectation. The gold was in the seams or facings, where the stone broke, and consequently the glitter was all on the outside. That it yielded well, however, there is no doubt. This party’s mill is worthy of more than a passing notice. The engine is a horizontal lever of twelve horse-power, and with the draught obtained by a flue of eighty-eight feet (advantage being taken of the hill, to save expense in erecting a chimney), it works up to its full capacity. There are 8 stamps, which are rather light, but heavier ones are about to be ordered. In 1870 a boom in quartz mining investment resulted in an unprecedented number of public mining companies in operation, and transformed the goldfield's flagging fortunes. One of the reasons was the injection of capital from outside the district - Numbers of gentlemen experienced and interested in mining in other gold-fields have visited Castlemaine, and show their belief in its auriferous resources by investing their capital. 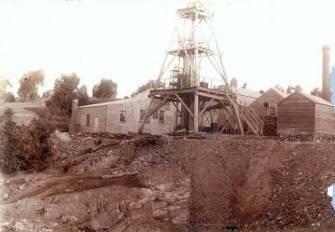 In the late 1890s a new ore processing technique commenced being used in Victoria. 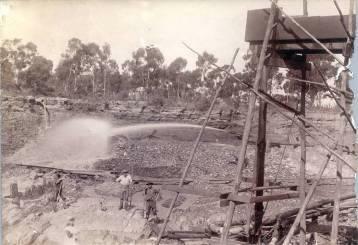 Although cyaniding was already well-established overseas, particularly in South Africa, its introduction to Victoria had been delayed by patent restrictions, which, along with an attendant heavy royalty, were abolished in February 1896, making the treatment of low-grade tailings in Australia feasible. 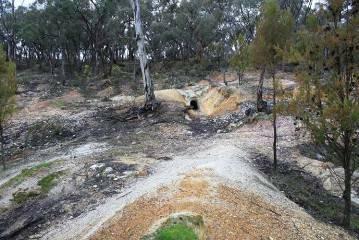 The cyanide process was not initially widely adopted in Victoria as assays of tailings in many cases found to contain too little gold to warrant the expense of cyanide treatment. It was not until the Depression of the 1930s did the price of gold rise sufficiently to make the cyaniding a viable industry. At the turn of the twentieth century new developments in hydraulic sluicing began to revive the fortunes of alluvial mining. Ray Bradfield, a local historian, provided this description of one of the early dredges - The dredge was powered by a pair of compound steam engines, 16 hp. Her boiler was 22 feet long, and 8 feet in diameter, her pumps operated a nozzle jet at 45 lbs per square inch pressure, and put through 7,000 gallons per minute. Her buckets held four and a half cubic yards, and 11 of these were discharged in each minute, under ordinary conditions. ...Over the three years, 1907-8-9, she treated 223, 580 cubic yards of ground, covered 27¼ acres, of an average depth of 15.3 feet. In those three years, she produced 4,024.91 ounces of gold, and paid the shareholders about £1600 per year in dividends. There are many relics and traces of gold-mining, ruins of gold-rush settlement throughout towns like Castlemaine and Chewton which still bear, in the buildings and streetscapes, the heritage and magic of their golden past. 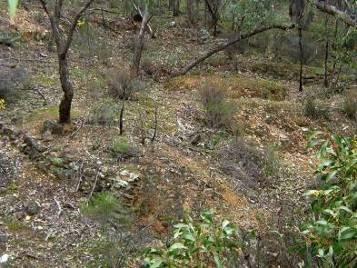 The surrounding Box-Ironbark forest has its own secrets. Its natural attributes—bush life, topography and geology— coexist with historic gold rush mining relics and evidence of Aboriginal occupation to form an extraordinary, layered landscape. Finding your way – There is a Visitor Information Centre at Castlemaine that can help you with information about the trail, tour guides, accommodation, special facilities, maps and any other queries. Getting a bed - You won’t have to sleep under a wagon any more. 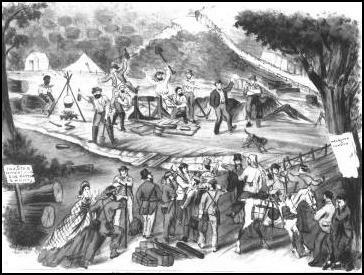 You can put your feet up in a luxury bed and breakfast establishment, drop into a convenient motel (from the luxurious to quite comfortable) or, if you decide on a cabin or camp in one of the caravan parks, you are still way ahead of 1850s accommodation. Getting fed - It is easy to find excellent coffee shops, cafés and restaurants throughout the region—try a different one every day. There are also many great places to enjoy a picnic lunch. Tracks and trails - Some roads are unsealed, and may sometimes be a bit dusty, muddy or bumpy. If you are not accustomed to unsealed roads, remember to drive slowly, particularly on corners. The walking tracks are OK for a person of average fitness, but you will need a strong pair of walking shoes for all but the shortest of strolls. Smooth rides, suitable for wheel chairs are indicated at the top of site pages. The Visitor Information Centre is open every day (except Christmas Day) and provides visitors with many forms of information about the Diggings, including video clips, books, maps and photographs. They also provide an Accommodation Booking Service (1800 171 888), bicycle hire and portable MP3 players with guided audio tours of the town and the Diggings Sites. 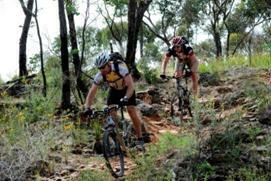 · www.goldfieldstrack.com.au – The Goldfields Track is a journey through time. 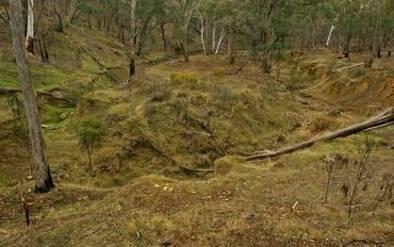 Central Victoria ’s gold rush history was forged in its historic towns and goldfields, and the dramatic changing landscape of forests and open country. 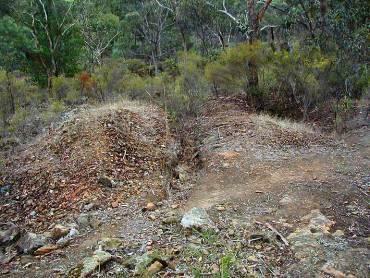 Shared by bushwalkers and mountain bike riders, the Goldfields Track cuts a 210km pathway through the heart of Victoria ’s historic goldfields. Narrator – Jan ‘Yarn’ Wositzky and interviews with Robyn Annear and Dennis O’Hoy. • THE RUSH – you will hear about the gold rush proper, and visit the places where it all happened. • THE CHARACTERS – here you’ll travel to the ghost towns beyond the main rush and meet the people who were there, the men and women, the civilized and otherwise. • NEW GOLD MOUNTAIN – you will be introduced to the stories of the indigenous Jarra people, where geology meets the Dreamtime, and also bring you the wonderful tale of the Chinese who came to this place they called New Gold Mountain. Narrator – Jan ‘Yarn’ Wositzky and interviews with Jaara Elder Brien Nelson. a busy and noisy gold mining centre, filled with the noise of the thumping of batteries crushing quartz rock and trolleys trundling along railway lines, of horses pulling carts and people digging, building dams and stone walls and huts, and the cries of children and dogs. What these people left behind are like pieces of Braille, scattered across the land, and it’s from these fragments that we are going to imagine and tell the story of this place, the Eureka Reef, and of the people who were here. Narrator – Jan ‘Yarn’ Wositzky and interviews with Felix Cappy, Robyn Annear, Brian McCormick, Ben Laycock and Ken Parker. Castlemaine is the creative person’s country town, rich in the cultural heritage of the Victorian Gold Rush. Wherever you go in Castlemaine you can see it. Wherever you go, you can feel it – in the art galleries, the Botanical Gardens, the Market Square or just walking in the streets. Relive the colourful history as told by local identities. 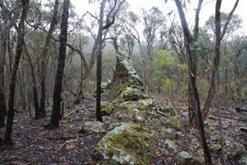 Victoria ’s golden centre is an ancient landscape, dotted with forests, grasslands and volcanic mountains. It bears the legacy of waves of people. Beginning with the land’s first people, the aboriginals – Jaara or dja dja wurrung speaking people – who touched lightly; now the region bears the scars and magnificent embellishments resulting from one of the world’s earliest and greatest 19th century gold rushes. Prior to the gold rush, there were many Aboriginal clans in central Victoria all speaking the dja dja wurrung language. This film will help people see that on this transformed country, before the times when the world came looking for gold, walked men, women and children who carried with them everything they needed for survival tools, ceremonial implements and possum skin cloaks. 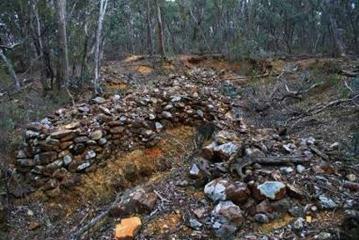 The film illustrates the history of the gold rush through its surviving evidence preserved in the Castlemaine Diggings National Heritage Park . This park is a cultural landscape comprising an area of Box-Ironbark forest containing archaeological and landscape features associated with the Mount Alexander Gold Rush. This film presents a range of community based events that take place in and around Bendigo , Castlemaine and Maldon. This small triangle of Central Victoria boasts many of Australia ’s oldest community events and possesses one of the busiest event calendars you will hope to find. This richness stems from an inspiring environment and its strong and creative communities, whose roots are deeply intertwined in Victoria ’s gold rush past. This film showcases the region’s concentration of artistic talent. Bendigo , Castlemaine and Maldon are bursting with artistic activity; you will find it everywhere, in galleries, theatres, on the streets, in café’s, at markets and even adorning the locals themselves. It’s the quality of life, the quality of the air, the light, and the connection with the land and history of the place that makes it so attractive. Maldon’s folk festival has been going over 30 years. It still remains true to its founding principles of supporting Maldon’s tourism focus as Australia ’s first notable heritage town, being affordable to families and showcasing traditional Australian and multicultural music and dance. 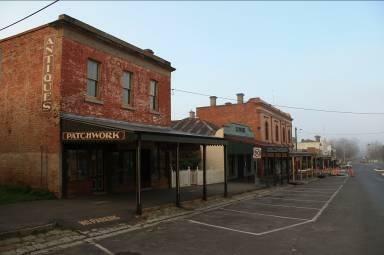 It takes place in Maldon’s famous historic main street, many of the town’s heritage buildings and also in the bush at nearby Mount Tarrangower . 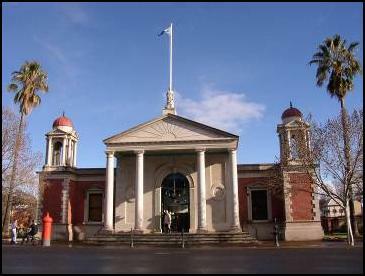 Founded in 1913, the Castlemaine Art Gallery and Historical Museum has acquired an excellent collection of Australian art works and of historical items from the district’s past. The 1931 art deco building is noted for its elegant design and is Heritage listed. The building has been extended a number of times. The Gallery and Museum is fully accredited by Museums Australia. Drawing on the Historical Museum ’s collection, the thematic exhibition Camp to City: Castlemaine and Mount Alexander District presents a rich and colourful history. 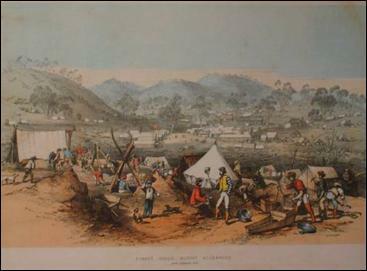 Themes include: indigenous Australians; the goldrush and mining; Chinese on the goldfields; the regions’ development; surrounding towns; prominent early citizens; 20th century Castlemaine and much more. The Gallery has always specialised in Australian art. Its particular strength is in major works of the late 1800s, the Golden Period of Australian painting, and the Edwardian era. Traditional landscape painting is a feature of the collection. More contemporary artists are also well represented. 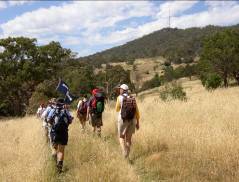 The Great Dividing Trail, a community-planned long distance trail that allows recreational walkers and tourists the time to savour central Victoria's unique combination of gold rush heritage and its natural beauty. All major entry points are accessible by public transport as well as by road from smaller centres, with the possibility of overnight Accommodation and camping. 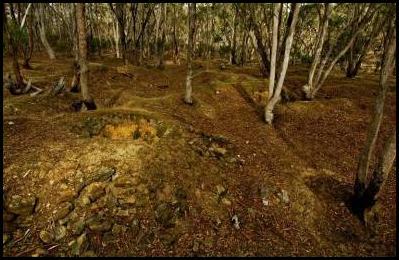 · Goldfields Track containing three sections - Dry Diggings, Wallaby (incorporating former Federation Track) and Leanganook Tracks). The GDTA sells maps for the Lerderderg Track and the three tracks that comprise the Goldfields Track via its website, www.gdt.org.au, using PayPal. 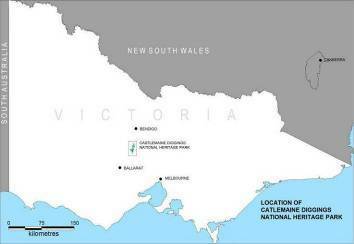 Information Victoria also sells the maps (80 Collins St Melb,1300 366 356) as do several regional visitor information centres.